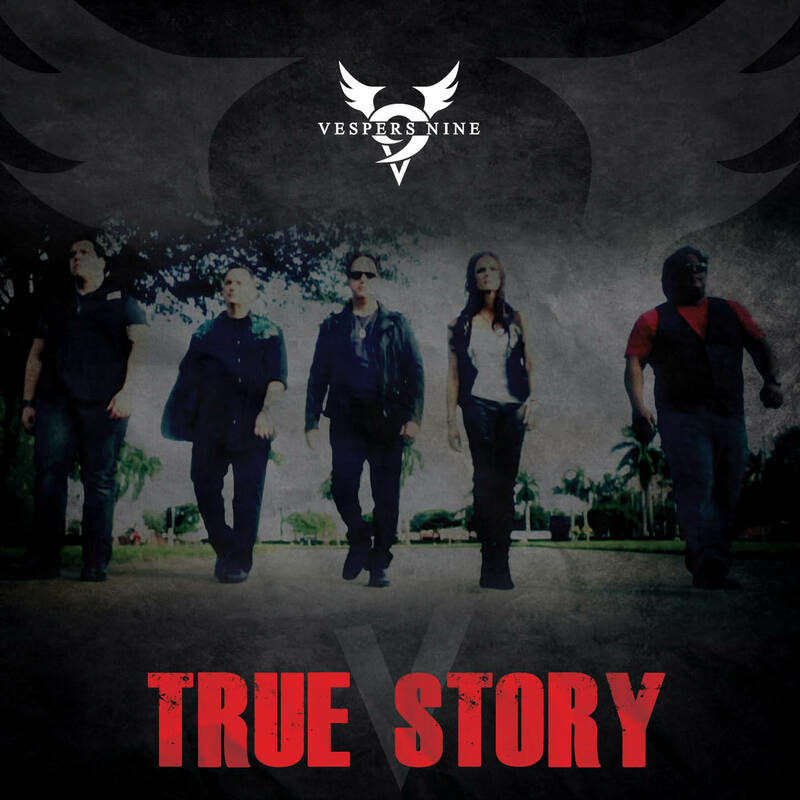 Miami, FL – Much to the excitement of music fans worldwide, classic rock ensemble Vespers Nine will be releasing their eagerly awaited debut CD ‘True Story’ on September 27, 2014. Vespers Nine, a five member premier classic rock band based out of South Florida, launched in late 2012. Made up of well-seasoned musicians, the band is a versatile, high energy rock band, that also writes and performs it’s own original music. Musical influences include Foreigner, Journey, Heart, The Beatles, Queen, Van Halen, Styx, Rush, Metallica and Boston to name only a few. The entire ‘True Story’ album was recorded at AfterHours Recording Studio, in North Miami, and all songs were produced by the accomplished and renowned music producer, Hal Batt. The recording of the album spanned over the course of several months, with sessions running sometimes as short as several hours, to well up to 12 to 14 hours straight, for several days in a row, in some cases. JOHN SIMON (Lead and background vocalist), a seasoned musician fronting the band’s lead vocals, offers an amazing full range voice and brings an ability to sing just about anything to the band. His versatility, vocal power and control allows the group to do a wide range of musical styles, while always maintaining a rock feel. John is also an accomplished drummer and percussionist. JAMES MARTINEZ (Lead and rhythm guitarist, background vocalist), is also a well seasoned player who, with his wealth of live performance experience, adds his unique playing style that includes fierce solos, and everything from heavy crunch rhythm parts, to haunting clean sounds – running the gauntlet of guitar. All in all, James incorporates a dazzling array of guitar techniques and sheer intensity into the songs that he has written or collaborated on. His facility on the fretboard brings about piercing and emotive soloing that is nothing less than captivating. James also adds harmony vocals to Vespers Nine during live performances. JESSE RIVAS (Lead and rhythm guitarist), also a well-seasoned guitarist, is known for his ability to blend heavy, intense guitars with melodically nuanced song structure. Well versed in music, through his formal musical education, Jesse’s playing is both intense and dramatic, with fast tempos and harmonized leads, but he can just as easily streamline to a more commercial and expressive range. This versatility shows in his broad writing and playing style that lends itself well to a band that enjoys covering many stylistic bases. GRICEL JULIE DOSAL (Bass player, lead vocalist and background vocalist), brings years of live performance, writing and studio recording experience to the band. Gricel’s playing brings a groove, tightness and melody to the band with her emphasis on time and feel that helps bond the rhythm foundation. Her style locks easily in with the drums and always effectively bridges that gap between guitars and drums. Gricel’s playing locks in a solid groove helping to keep the band’s impeccable time and sets the foundation for the other melodic instruments. As a second lead vocalist, Gricel (younger sister to lead vocalist, John Simon) adds her own particular vocal style and range, along with her own distinct resonance when taking on the occasional lead vocals. However, being the younger sibling of the lead vocalist, it’s the background harmony vocals which are a highlight of the group. Due primarily to the fact that natural sibling compatibility works extremely well with vocals harmonies, Vespers Nine enjoys a genuine advantage with well-blended vocal harmonies. GEORGE DOSAL (Drummer and percussionist), brings extensive knowledge from his many years in cover and original bands, along with much studio and live performance experience. His diverse and distinct style is formed from a variety of influences that range from rock, hard rock, progressive rock, jazz, Latin and everything in between. George is highly adaptable to any and all styles of rock, which allows for his ability to layer styles and add flavor to the band’s music; he is an integral part of the Vespers Nine sound. On Saturday, September 27th, 2014, Vespers Nine will be hosting a CD release party concert for ‘True Story’, which will feature Jack Russell’s Great White, Guest Star, Liverpool’s Phil Kenzie (Recording and Touring Artist From The Beatles, Eagles, Rod Stewart, Al Stewart etc. Credited to over 130 top charted albums). Plus, Special Guests Appearances! Hosting the event is South Florida’s Classic Rock & Clear Channels own Andy Preston. Tickets may be purchased at http://www.seasidemusicmgmt.com or at the door, day of event.